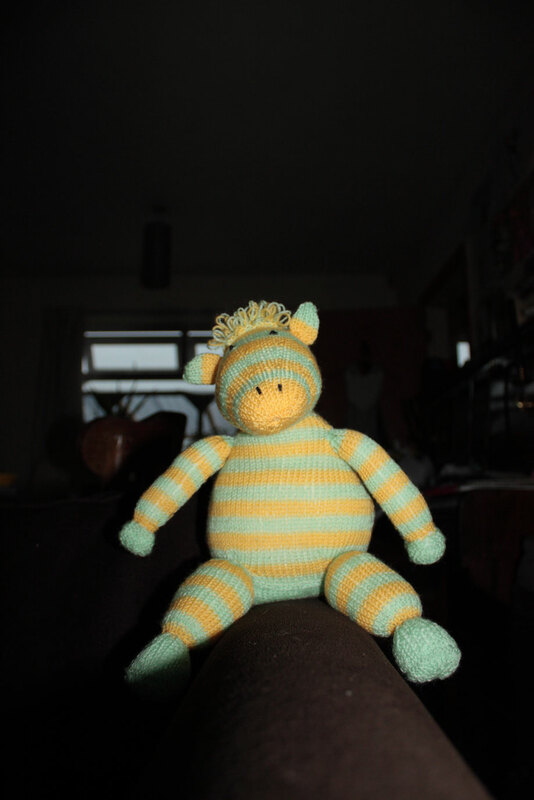 This is a knitted zebra I made for my darling stepdaughters birthday. She requested green and purple but I had no purple wool in the right weight. So yellow it is. She likes yellow so this is ok. The yellow wool cam from my stash and is Cygnet 4 ply. The green was a charity shop find. I got a massive cone of the stuff for £5. I have so very much left! To see the rest of George's photo shoot hop on over to my blog. Adorable! Thanks for visiting my blog so I can come and check you out! Lovely! This is just lovely, I know your step-daughter treasure it for years to come. I love knitting too because whatever you knit if you use a natural yarn will always be a keepsake. awww he's is so cute! I love knitting toys, they are so much fun to make! Aaawww it turned out adorable!! I love it, thanks for sharing! Cheap t shirt fabric and I MEAN CHEAP !! !